Title: 'America Meridionale, published in Venice 1696. 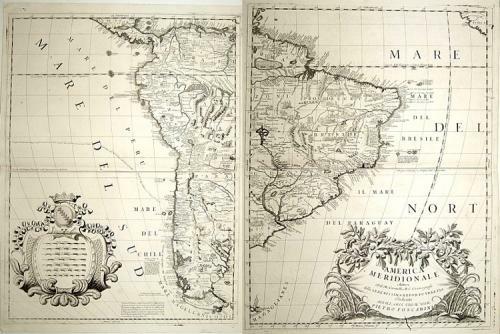 A matching set of 2 attractive large folio maps depicting all of South America in the grand Coronelli style. There is a splendid large ornate cartouche with Coronelli's normal flourish. Many of the primitive notions of the new world then prevalent in European thought are illustrated and the map can be seen as subtle propaganda to the user of the day. It shows many highly specific views of the continent with savages harming each other through many cruel and barbaric means including warfarce and torturing. All of the natives are depicted as aggressive savages, consistent with the thought prevalent at the time. The map also depicts real and imagined places, rivers, mountains, as well as strange and wonderful animals including ones with many heads! The mountains and river courses are many cases highly speculative and at times quizzical. The map is in excellent condition and is rarely seen on the market.